Recently I was away skiing in Hundfjället, Sälen, Sweden. I went into the second steepest slope there, as the steepest one (The Wall) was closed off for upcoming competitions; and as I fiddled with the camera which was attached to my right foot/leg, I did not see in which direction my friends turned at the bottom of the slope. I saw the warning for a crest, but nothing told me which way to turn, so I turned directly towards the lift system where the snow was n0t prepared so I sank through the crust with the left ski (snowblade) which made me do a faceplant on the icy crust at high speed, pushing my glasses into my face and doing some friction damage. You were supposed to turn left instead, apparently. And here is a video from the camera I messed with before going down the slope! The reason why it all happened. And with this the blog has its first content :) yay! 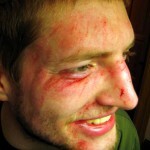 This entry was posted in Trips and tagged Blood, Injury, IRL, Skiing, Trip, Video. Bookmark the permalink. One Response to Skiing faceplant!